Cutlan's composing work - connected to his creativity as an improviser - spans many styles: contemporary classical music, world music and jazz. 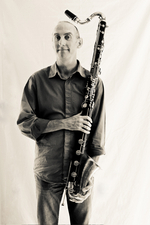 Paul Cutlan's work as a multi-instrumentalist and composer is informed by many styles, including contemporary classical music, world music and jazz. His work as a composer is an increasingly significant extension of his main work as a performer and improviser. Born in Hobart, Tasmania, Cutlan developed a passion for improvisation while at high school. He studied clarinet and composition at the Tasmanian Conservatorium of Music, graduating in 1987 with Honours in Composition. His early performance experience includes work with the Tasmanian and Sydney Symphony Orchestras. Cutlan has since developed his skills as an improviser, performing with many of Australia's leading jazz musicians and groups. He has been a long-standing member of two groups which straddle a range of genres and cultures - world/jazz group MARA!, and the Australian Art Orchestra. The versatility of Cutlan's artistry has seen him work with talent as diverse as Geoffrey Rush, Gurrumul, Australian Chamber Orchestra and Ensemble Offspring. Cutlan's first major commission was as composer and musical director of a cabaret show for the 2003 Sydney Festival. Featuring jazz trio and narrator, Birth of the Cool celebrated the poetry and stories of the Beat Generation. Subsequent seasons in Edinburgh and Germany followed. A desire to combine his passion for contemporary classical music with his practice as an improviser led to post-graduate study at Sydney Conservatorium of Music. While completing his Master's degree in composition, Cutlan developed a close working relationship with improvising string quartet The NOISE. They feature in several of his works, including Across the Top, for woodwind soloist, string quartet and double bass. This is the title work of Cutlan's debut CD as composer and leader, and is released by Tall Poppies. Works from the last five years incorporate an eclectic range of styles and cultures. Most pieces have been written for colleauges, with commissioning bodies assisting, such as Ars Musica Australis, and Aurora New Music Festival. Artists who have performed Cutlan's work include didjeridu artist Mark Atkins, bass recorder virtuoso Alicia Crossley and viola da gamba specialist Jennifer Eriksson. Recent larger ensemble jazz works include Nock on Effect, premiered by Ten Part Invention, and The Darkness of Silence, commissioned by the Divergence Jazz Orchestra with the assistance of the Australian Cultural Fund. The darkness of silence : big band (2016) Commissioned by Divergence Jazz Orchestra. Affirmations (trios: recorder, didjeridu, cello) (2014) Commissioned by Aurora Festival with funds provided by APRA, Blacktown Arts Centre. Spinning forth : suite for viola da gamba and harpsichord (2014) Commissioned by Jennifer Eriksson, Philip Pogson. Merge/Emerge : for string quartet (2013) Commissioned by The NOISE string quartet, for inclusion in their CD Composed NOISE. Times past : for bass clarinet and viol consort (2012) Commissioned by Ars Musica Australis, Rev. Dr Arthur Bridge.